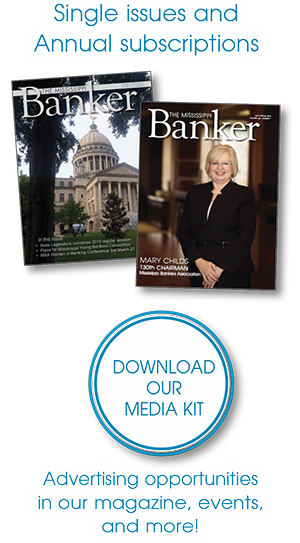 The Mississippi Banker magazine is published quarterly, providing banking-related news and events relating to Mississippi. Readership includes 98 percent of the banks in Mississippi. Copies are sent to CEOs, bank employees, and bank-related firms. Libraries and public officials, and every bank branch in the state receive copies as well. or share your bank's good news: editor@msbankers.com. If ordering a single issue, please specify which issue.